This is a female Dickcissel that I worked on a couple of weeks ago. I was told that they are not common occurrences in the Chicago area. It looks very sparrow-like, doesn't it? I thought for sure that they are related, but Dickcissels are currently placed in the family Cardinalidae which include grosbeaks, tanagers and cardinals. S. americana is a bird of prairie and savannah habitats. While much of that type of habitat has been greatly altered here in the Midwest, there is evidence that these birds have been able to adapt to agricultural and secondary habitats. And indeed, they certainly have in their wintering habitats. During the nonbreeding season, they form massive flocks in wintering grounds in parts of South America, specifically the llanos region of Venezuela. There, the flocks have earned them the reputation of a major crop pest. 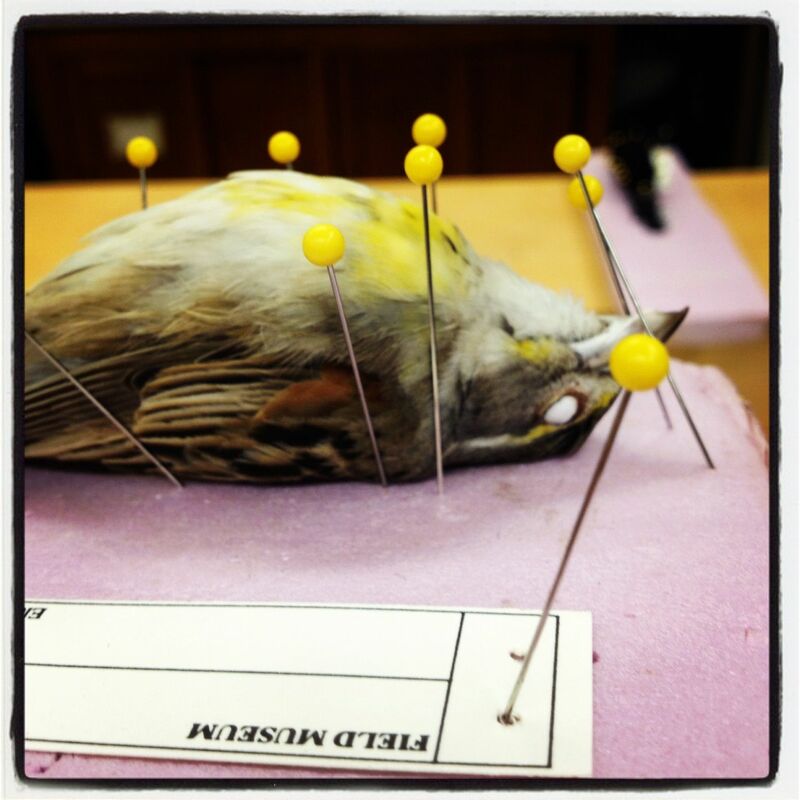 Since most of the Dickcissels' native habitats have been altered to agricultural use, they no longer are able to feed on native grasses, but have switched their diet to rice. The bird is known as the "el pajaro arrocero", or rice bird, in Venezuela. There sorghum and rice farmers kill the birds in massive numbers, and this is believed to have had unfortunate effects on their overall populations (duh). Ecological darkness aside, but not entirely, it's amazing to think that so many of the species I see during the spring and summer here, have come from far away and have been living this other, very different part of their life cycle. It's good to be aware that in terms of any type of conservation for a bird species, you can't just conserve one part of its range. It's no good to set aside habitat here in the north, if their wintering habitat is being destroyed down south. In many ways, birds are true global citizens, and remind us that its one planet, people.